Plump firm cashews, are dipped in rich chocolate and panned to a silken sheen. Now available in both creamy milk chocolate or 65% cocoa content dark chocolate. Indulge! [GF]Contains no gluten ingredients. [U](D) Kosher certified. 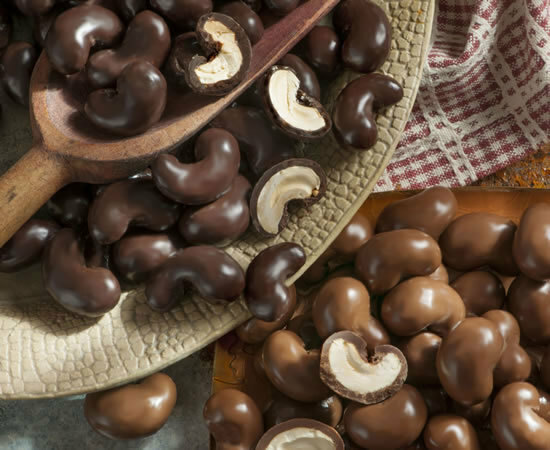 These milk chocolate covered jumbo cashews will tantalize your taste buds! I'm so disappointed as I thought I ordered two cans, but alas I erred and ordered only one. These are a definite winner! My daughter gave me a tin of these for Christmas. They are addictive! Best I ever had.